From the beginning of life I have lived in a cosmopolitan community. I had friends belonging to the north India and some from the southern part of India. Which ultimately resulted into introduction to variety of food. Some of it got noted into mother’s recipe book and some on the tip of my tongue. One of the loved recipes is Mint Rice. 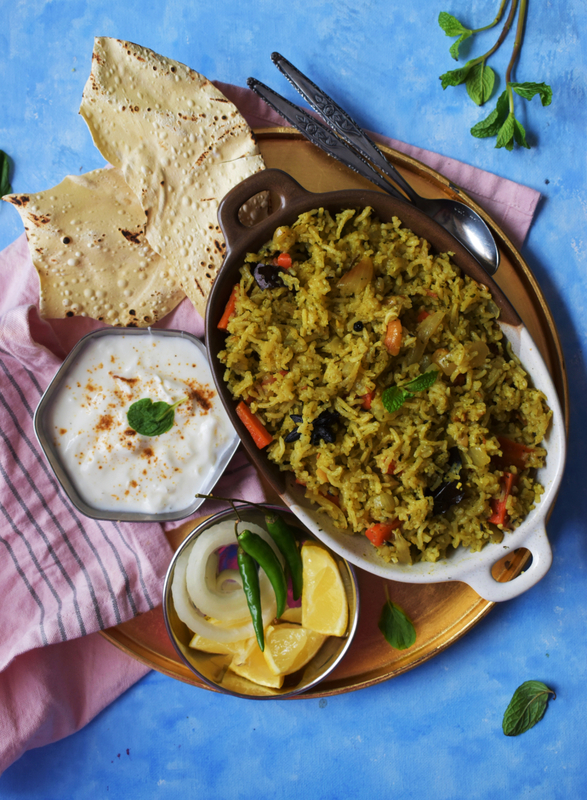 The freshness of mint and all the dry Indian spices make a perfect companion to the soft Basmati rice. I have memories of eating it from one of my friends tiffin one afternoon at school. I was so mesmerized by the overall taste that I asked her mother to write down the recipe for me. I then went home and asked Mom to make it. The joy of eating Mint Rice was boundless. I eventually learned to make it myself and would make it rarely until I reached the States. The moment I encountered the Potluck parties with friends, I realised that I need to show my variety and B-A-M!! Mint rice status was re-instantiated!! This recipe is nothing that’s very difficult or has ingredients that are expensive or difficult to find. As the name suggests, it has Mint and Rice and some aromatic spices that amp up the entire dish. Mint Rice is quick and easy recipe that tastes magical and the freshness of the mint makes it all the more delectable. 1 cup Basmati rice or any long grained rice soaked for 1 hour. 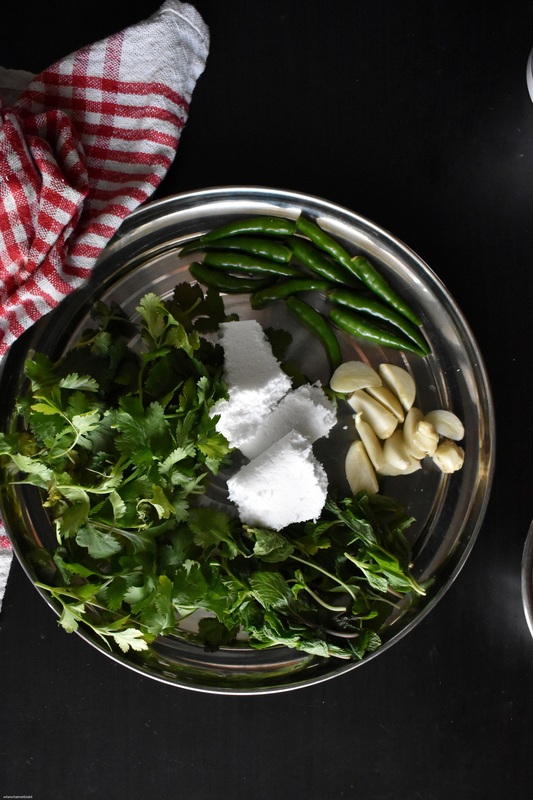 Make a paste of coriander, mint ,chilies and coconut with 2 tsp of water. In a pressure cooker, heat oil on a medium flame. Once the oil heats, add all the dry spices (star anise, cloves,pepper corns,bay leaf,cinnamon,cardamom) and saute until the aromatic smell starts emitting from it. Add the mint-coriander paste to the pressure cooker and saute it for a minute. To this, add onions and carrots and turmeric powder. Mix everything together and let it cook for 2 mins. Once the water comes to a rolling boil, add soaked rice. Don't over mix the rice because the grains might break. Stir it lightly and cover up the pressure cooker with lid and cook until 2 whistles over medium flame. Once done with 2 whistles, turn off the heat and let it cool for 5-10 minutes. Open once the steam has escaped and serve warm. The ratio of mint to coriander should be 2:1 because too much can turn it slightly strong. Mint rice is the rice that you make when you are bored of all the other flavours. 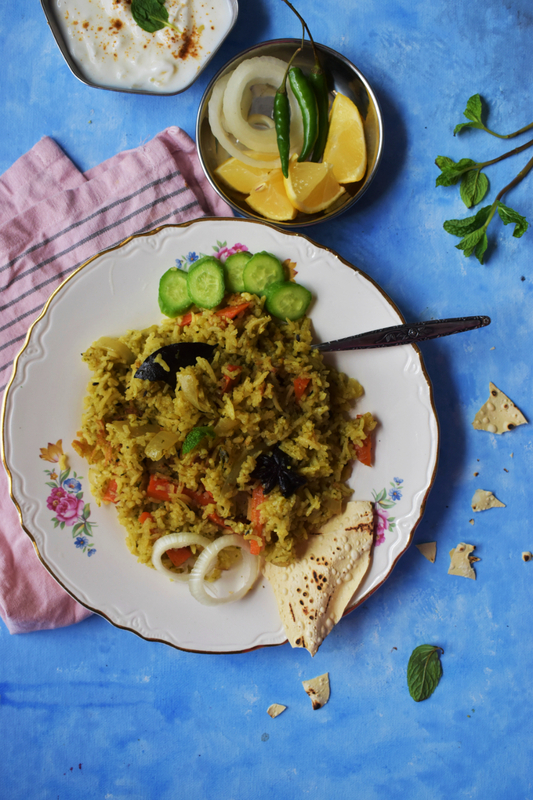 This rice tastes perfect on a rainy day when paired with roasted papads and pickle. You can also pair it with salad and raita to make it more interesting.